We have been involved in a comprehensive assortment of excavation projects ranging from domestic service pipe and drainage pipe installation, repair and replacement right up to complete mains repair and replacements on large commercial, retail and industrial estates. We offer a quick response service for emergency repairs on domestic properties for private customers and commercial premises and industrial zones. In addition, we specialise in trenchless moling to lay and repair pipes, water and gas mains, ducts and cables. Trenchless moling is a subsurface construction procedure that requires only an entrance and exit pit to be dug and no continuous trenches. 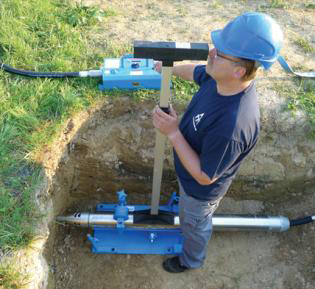 It can be described as a process for the installation of new or replacement of existing underground infrastructure, including supply pipes, water and gas mains and drainage pipes with minimal disruption to surface traffic, business, and other activities. A conventional excavating procedure for digging narrow trenches. We use powered pedestrian excavators that quickly ‘slices’ through soft ground up to 4’-0” deep for installing supply pipes, water and gas mains and drainage pipes, cables & ducts (up to 5′′ diameter). 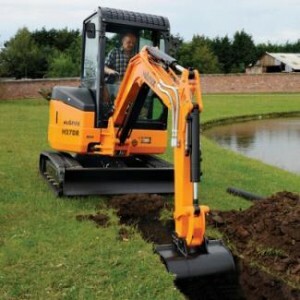 Pedestrian excavators cause relatively little disturbance and surrounding ground is not churned up. 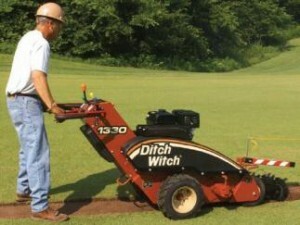 The cutting tool simply channels a slot in the ground and there is very little back filling required. When we need to excavate wider (up to 24”wide) or deeper (up to 5’-0” deep) trenches, we employ one of our mini-excavators. They are perfectly suited to operate in confined spaces where other, more substantial excavators, would find difficulty to gain access. These powerful mini-diggers make short work of digging trenches and replacing displaced soil enabling us to carry out any job, quickly and efficiently. Hall Mechanical Services Limited is a registered trench-excavating contractor, approved by many Water Authorities throughout the UK. We have built a reputation, over many years and several generations of Hall family members, providing competitively priced solutions and employing skilled and qualified engineers. For us, only the best is good enough which is a philosophy we share with you, our customer. Call us on 01527 889580 or email us at sales@hmswater.co.uk for a professional and efficient response to your enquiry.